Massage therapy is over-rated. At least in my opinion. But before all the spas, massage parlors and masseurs detest me, I have to put a disclaimer that this opinion is not based on scientific nor medical facts but purely on my personal experience. I grew up in Manila, where a massage parlor has a connotation of something else. Something shady. Where there is more hanky-panky “extra-service” occurring than a real massage. Maybe it has changed now. But that somehow influenced my view of them. I just don’t go to them. They also have massage services available in that resort. Due to the prompting from my friends and from my wife, encouraging me to have a massage to complete the spa experience, I obliged. Before the masseuse started working on me, she asked me when was the last time I had the massage. To this I answered: “never.” She was kind of surprise in my answer, but am I the only one who never had a massage therapy? Well, that’s not true, I had massage therapy before. There was Mamang Hilot who treated me when I was a kid for my “pilay” (see previous post). Then when I was older, Mang Tony, the barber in Sta. Mesa will give me back and shoulder rub, after slapping a whiff of alcohol in my neck and face at the end of my haircut. Do they count? Back to the massage, when the masseuse was giving me the therapy, I was so uptight that my muscles were so tensed. I was as relax as I was when having my teeth cleaned at the dental chair. The masseuse even told me at least twice, “Relax and let go.” But how can I, when I feel it was somewhat painful to have my muscles squeezed and mashed? Must have been a deep-tissue massage, eh? 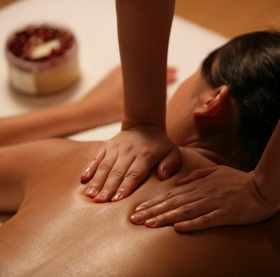 Massage became widely used in Europe during the Renaissance. In 1850’s, two American physicians who had studied in Sweden introduced massage therapy in the US, where it became popular and was promoted for a variety of health purposes. (Now, I know where the Swedish massage originate.) However, with scientific and technological advances in medical treatment during the 1930’s and 1940’s, massage fell out of favor. Interest in massage revived in the 1970’s, especially among athletes**. Today, with proliferation of massage parlors and spas, massage has been mostly used to relieve stress and promote relaxation. After 30 minutes in the massage table, that seemed forever for me, my “agony” was finally over. I was more relieved that it ended. The masseuse then asked me when will I have my next massage. Honestly? Never again! But that’s not what I said. “I’ll think about it,” was my less emphatic and genteel reply. Don’t get me wrong, it was not the fault of the masseuse, who I know was a competent massage therapist, and who I later learned was also a licensed physical therapist. Nor was there anything wrong with the parlor, for it was indeed a world-class resort and spa. It was just me. I am not used to this kind of pampering, and I have a different view of unwinding. I left the massage room more bent, not straight, than when I entered it. I then went back and soaked in the hot spring pool with temperature of 105 – 107 F. I felt the almost scalding hot water more relaxing, than the squishing and kneading of my neck and back. That evening, my muscles were all sore, as if I just played basketball with Jaworksi, with shoving, elbowing and all. That could have been more fun and relaxing.